Starring Sal Mineo, Paul Newman, Eva Marie Saint, Peter Lawford, Lee J. Cobb, Jill Haworth. Producer/Director Otto Preminger's 3 hour drama based on the internationally best selling book by Leon Uris. A vast, sweeping panorama of a craggy mountain side. An introduction to a widowed American nurse. And a blind, clutching attempt at escape for a prisoner of a British internment camp. 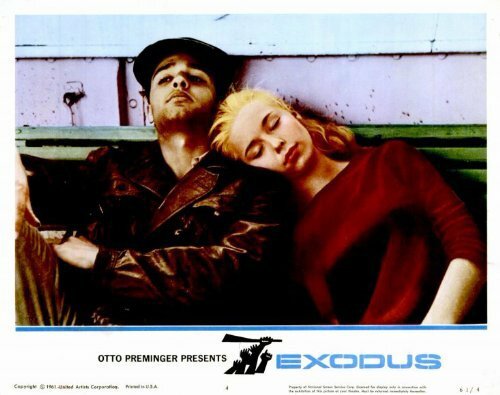 That is how Otto Preminger chose to open his screen adaptation of the successful Leon Uris epic novel "Exodus." And that's only the first five minutes of the film! A beautifully assembled cast of screen legends and character actors lend their talents to this richly-textured drama, which tells the tale of the establishment of the Nation of Israel. Nurse Katie Fremont (Eva Marie Saint) is a volunteer nurse at a camp where thousands of disenfranchised Jews are being held tentatively, as they have no homeland to return to. The promise of their own nation in Palestine was made in the heat of the moment, and was quickly forgotten. They endure endless injustice after having already made it through the nightmare of t he German concentration camps at Auschwitz, Buchenwald, and Dachau, and now they sit in anticipation for the day they are liberated from tyranny. The man to liberate them is Ari Ben Canaan (Paul Newman), a Jewish rebel with a cargo ship, a small band of loyal followers, and a master plan to shake up the British government. A brave rescue is hatched when Ben Canaan is able to secure 611 Jewish inmates for his voyage before being found out by military authorities. A ship-wide hunger strike is waged against the indifferent powers-that-be, and soon, they have no choice but to give in to the demands of the starving radicals. Meanwhile, Nurse Kitty has grown very fond of Karen (Jill Haworth), a young Jewish girl searching for her estranged father and some semblance of a normal life. She too has taken up Ben Canaan's cause, much to the chagrin of Nurse Kitty, who has plans to take young Karen to America in hopes of starting a new life. 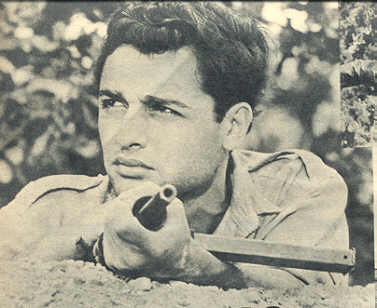 Meanwhile, opposition to the Jewish liberation partition is heating up, and Karen's misguided young beau Dov Landau (Sal Mineo) joins up with a radical Jewish terrorism network, led by Ari Ben Canaan's uncle Akiva (David Opatoshu), an anarchistic Jewish leader disowned by his family and hated by Palestine's British government. When their fatal bombing of the King David Hotel backfires, Akiva and his entourage are immediately taken into custody and issued a stiff sentence for their crimes. They are to hang within hours. Just blocks away from the ill-fated King David Hotel, Karen has met her shell-shocked father and now takes up residence in a thriving Jewish village. Nurse Kitty and Ari Ben Canaan have fallen in love, but they must hold off on their romantic involvement until things have settled with the liberation. But Uncle Akiva's incarceration proves to be a wrench in the gears, and Ari must somehow develop a plan to break the convicts out. Dov Landau, who managed to escape the arresting soldiers in the nick of time, agrees to turn himself in so that he can use his vast knowledge of explosives to rig the prison and plan an intricate escape route. All goes according to plan when the equipment is set off and violence errupts in the prison, giving Ari and the escapees the perfect opportunity for artifice. But the authorities are crafty, and manage to put a bullet in Akiva's back during a frantic high-speed car chase. The old man soon dies, but not before causing a major uproar at the prison. A liberated Israel is now in plain view, but Arab radicals, angered by the proposition of sharing their land with an "inferior race" plots to attack Ari Ben Canaan's camp and kill their leaders. Ari receives information about this attack ahead-of-time, and the group stages a mass overnight escape into the wilderness. Karen, ecstatic over the hopes of a new nation, proclaims her love for Dov Landau, and Dov reciprocates. They wile away the night-time hours thinking of long and happy life together that lay ahead of them. But as Dov sleeps, a wandering Arab radical assaults Karen, and in the morning, Dov's patrol party finds her blanched and lifeless body laid out on a tree-shaded dirty path, along with the body of one of their loyal compatriots hanging from a tree-limb. At the Jewish burial ceremony, Ari swears on their bodies that someday, Jews and Arabs will live together and share the land in peace. A promise that, to this day, goes unfulfilled. 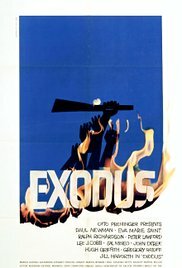 Thus ends Otto Preminger's drama "Exodus," not with a bang, but with an unanswered promise, and the burden of lingering injustice. It's an extremely powerful message, not at all wasted on a modern audience. This film is, in every context of the word, an epic. The direction, cinematography, and brilliant portrayals of the ensemble cast blend perfectly to create a true human drama. Paul Newman as a Middle-Eastern Jew with an American accent is slightly unconvincing, but he gives his character a sincere altruism that doesn't feel forced for one moment. His character genuinely wants the Jews freed, and the unbridled conviction of this passion wafts from the screen. Eva Marie Saint is competent in her role of an American nurse in a strange land, but she really could have made a little more of her screen time by emoting a bit instead of playing it "safe." Nevertheless, her character makes herself known through the wonderful dialogue, and her immovable stoicism lends the part a necessary strength that makes the friction with Paul Newman work. Jill Haworth is very authentic as a shy Jewish child seeking a family and a home. One of few child stars who could have nailed this character. She really pulls the viewer's heart-strings, and her demise at the end accomplishes its goal; it both shocks and saddens, all at the same moment. 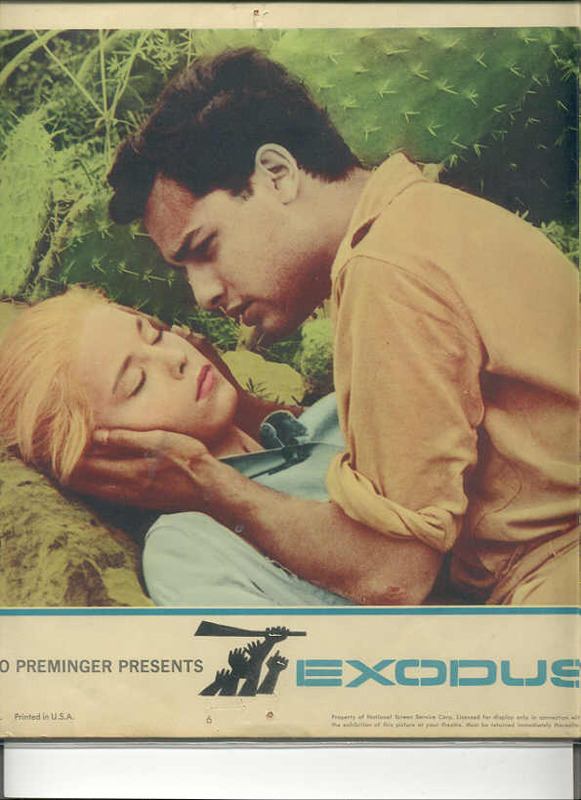 Of course, Sal Mineo as Dov Landau is terrific. The genuine article, a fabulous acting talent. It would have been wonderful to see him get more screen time, but that's Hollywood for you. He plays a character years younger than himself, and completely pulls it off. The rest of the cast was like the icing on the all-star cake. 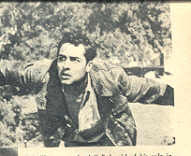 David Opatoshu is a pleasant surprise, as he usually played bit roles on television, giving memorable characterizations in shows like "The Twilight Zone" and "Alfred Hitchcock Presents." Here, he captures the essence of a fanatical Jewish anarchist with true artistic gravitas. As much as I've seen him on television and in other projects, he really is frightening here. He has tackled the vacant stare and nervous mannerisms of a man on the edge. And the highly-acclaimed score by Ernest Gold accentuates the menacing action of this film wonderfully. All in all, a great drama with a monumental style, a 60's Hollywood dream-cast, and a beautiful message. It has all the elements of a great American classic.